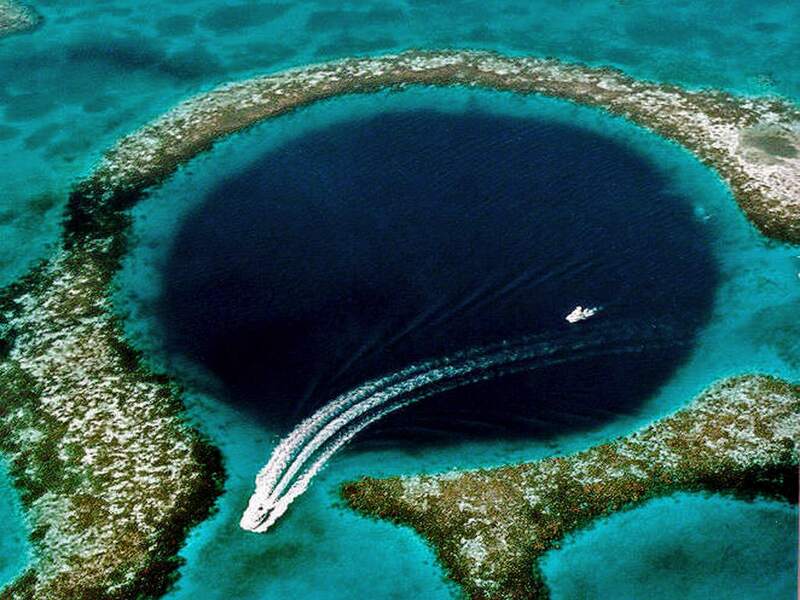 Great Blue Hole, Belize / U.S. Geological Survey, public domain. Photographs taken from the air show incredible, nearly perfectly round, deep blue circle in shallow atoll some 70 km east from Belize City. 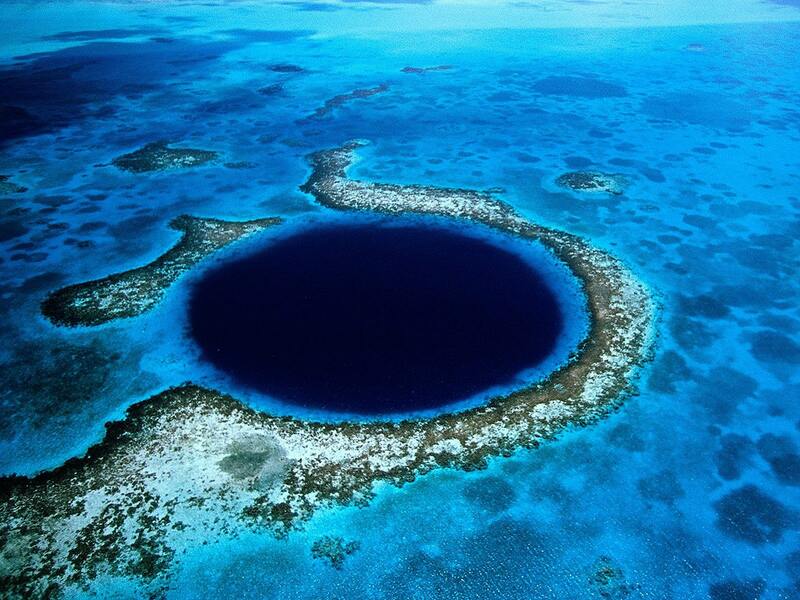 This unique formation is the Great Blue Hole – enormous sinkhole existing here at least for 150,000 years. Coast of Belize (and Mexico) is adorned with several elongated atolls. Further away from the mainland is located one of them – the Lighthouse Reef Atoll. 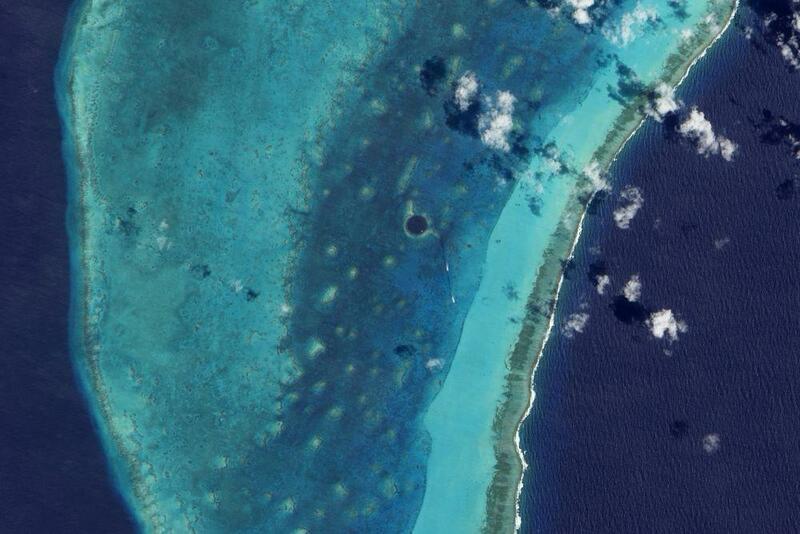 Great Blue Hole is located in the central part of this atoll. First explorations of this unique structure were made by legendary Jaques-Yves Cousteau in 1971. He and his team from ship Calypso charted the depth of the hole in 1971. They found that this is karst formation which formed in at least four stages. They were excited about stalactites seen deep below the sea level – dripstone forms only above the water level. Cousteau noticed that stalactites were tilted – at the time when they formed, Blue Hole was in a different angle than now. These exciting discoveries were shown in very popular TV series "The Undersea World of Jaques-Yves Cousteau", turning the Great Blue Hole into a true celebrity. Cousteau announced that this is one of the premium diving sites in the world. In 1997 there was organized expedition lead by Californian scientists Jones and Dill. They saw an opportunity to explore the past of the Earth here. Using the latest developments in diving gear, members of expedition managed to reach the bottom of the sinkhole as well as to explore the side passages. Special attention was given to the exploration of stalactites. Isotope analysis of obtained pieces of stalactites provided valuable data about the past of Great Blue Hole. Explorers reached and explored another exciting feature: Abyss in the northern part of Lighthouse Reef Atoll. This narrow fissure turned out to be at least 152 m deep. After a recommendation of such an experienced man as Cousteau Great Blue Hole turned into a popular diving site. As there is no dry land of significant size at Great Blue Hole, the diving trip here requires a full-day trip with local operators. Divers though often don’t meet their expectations – while they expect to see countless weird sea organisms in such an extraordinary location, they see just an incredibly large hole with occasional larger fish, including numerous sharks. The true beauty here lies in this unique geological formation itself and the numerous riddles and answers about the past of Earth hidden here. Rather late here was created marine protected area and around this same time in 1996 Great Blue Hole was included in UNESCO World Heritage Site list as a part of monument "Belize Barrier Reef Reserve System". Great Blue Hole is a nearly perfectly round sinkhole, flanked by a crest of coral reef which rises above the sea in low tide. The diameter of the sinkhole is approximately 318 m.
This sinkhole is a true blue hole which stands out against the light turquoise blue lagoon around it. Such formations are possible only in large carbonate platforms covered by the sea. Depth as measured by the team of Cousteau was 125 m. Jones and Dill in 1997 could not find a location deeper than 124 m – whether due to measurement imprecision of the previous team or due to the sedimentation over 26 years long period. There are some reasons to believe in such rapid sedimentation processes: there are no waves or currents below the depth of 18 – 20 m in Blue Hole and thus the sinkhole serves as a sediment trap. There exist similar structures which are filled with sediments – for example near Key Largo in the Florida Keys (United States). Sinkhole has hourglass shape in cross section. Unusual feature of Great Blue Hole is turbid, a brownish layer of water at the depth of 90 – 101 m, enriched with hydrogen sulfide H2S. Water above it and below it is lucid – with the difference that below this layer the water does not contain oxygen. Bottom of Great Blue Hole is lifeless, covered with large pieces of limestone. This unusual hydrogen sulfide layer has been created by the constant pouring of organic substances in Great Blue Hole. As these pieces of organic matter sink, they are decomposed by microorganisms. These microorganisms deplete all the oxygen at the bottom layer of water and form hydrogen sulfide. This, in turn, makes the water more acidic and it dissolves the limestone walls. Most likely this process has helped to create the hourglass shape of sinkhole. In 1997 at the 50 m depth in the west wall of Blue Hole there was discovered a cave – West Wall Cave. After this deep entrance the cave rises up to 37 – 41 m depth and then extends horizontally for more than 46 m. The cave contains many skeletons of marine turtles and other creatures. The depth of this cave coincides with the depth of the majority of stalactites and stalagmites. Most exciting finds of Cousteau were stalactites. Exactly these stalactites lured also the expedition of 1997. Most stalactites are located at the depth of 30 – 45 meters. They can reach impressive size – some are even 8 meters long. Divers found also several stalagmites. Dripstone formations need to be in the atmosphere – above the sea level. This means that at some time in the past at least the upper part of Great Blue Hole was above the sea level. 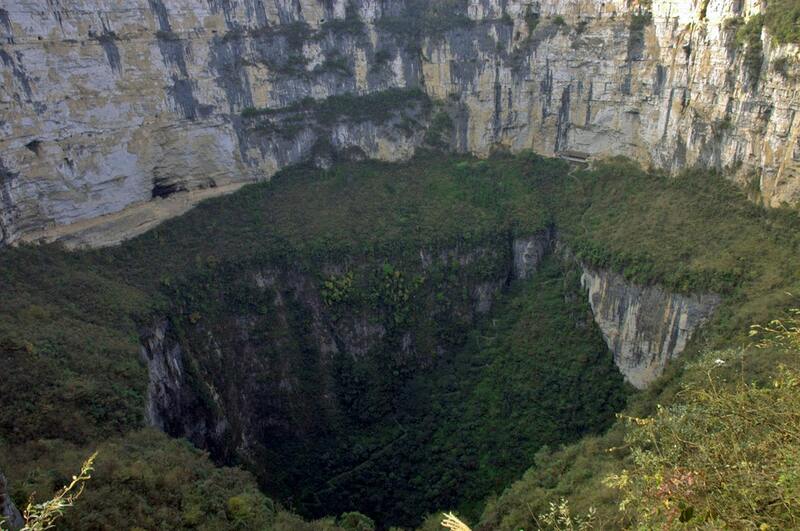 Even more – whole depth of sinkhole needs to be above the water level – formation stops at the water level (there exist exceptions in volcanic regions – see El Zacatón sinkhole in Mexico.). Stalactites themselves can provide an answer about the age of their formation – through the method of isotope analysis. The team of the expedition from 1997 took numerous samples (one of the rare cases when damage to stalactites is justified) and analyzed them. Result was exciting and at the same time foreseeable – stalactites (and the Blue Hole itself) have formed during at least four episodes of low sea level – 153,000, 66,000, 60,000 and 15,000 years ago. This corresponds well to other data of climate changes in the world, showing lower temperatures at these periods. Another exciting feature of stalactites and stalagmites is their tilt. Some are straight, some tilted, some are half tilted and half straight. These dripstone formations have fixed some tectonic change in the past, when the angle of Great Blue Hole and surrounding layers of carbonate changed. Tilt of dripstone formations is some 5° – less than 11 – 13° reported by the expedition of Cousteau. Reports of Cousteau team about stalactites at 120-meter depth are not credible either – acidic water at this depth would dissolve any dripstone formations. The mechanism of formation of Great Blue Hole remains unclear. First – it is too deep if we remember that its full depth is a lot larger and the true bottom is hidden below a thick layer of sediments. Sea level in the past did not fall THAT much. Second – it is not clear how the sinkhole formed. Lighthouse Reef Atoll is small and separated from the mainland by at least 1.200 m deep sea. Sinkholes require a rather powerful flow of freshwater – and consequently, there is needed sizeable landmass. 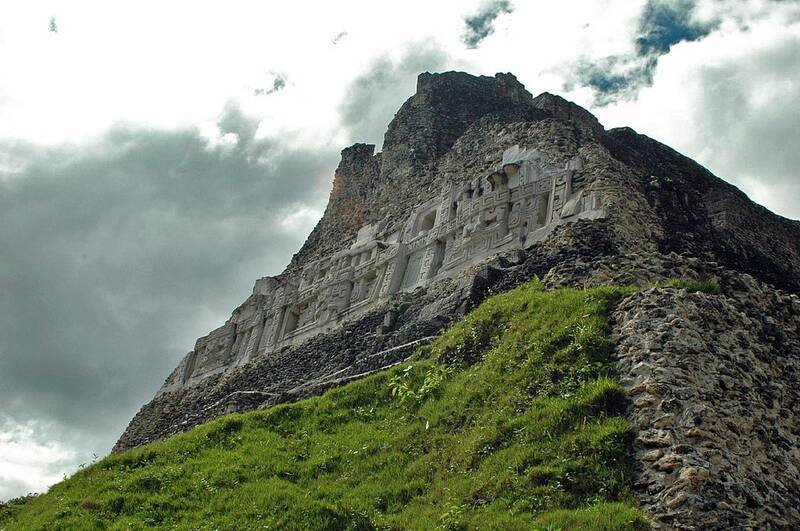 Although Belize is small country, here are located numerous outstanding and surprising monuments. From the Blue Hole at Lawson Reef and the wreck of the Umbria in the Red Sea, to Michaelmas on the Great Barrier Reef, the Dive Atlas of the World offers a global tour of top dive sites, described and photographed by experts.